We've been making a lot of cakes in school recently. Today we made a lot of chocolate decorations. This cake has a layer of brownie first, then a layer of milkchocolate mousse and on top of that, a white chocolate mousse. 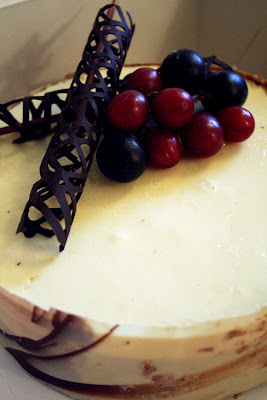 It's decorated with grapes and chocolate. Åh, ja. Den var fantastiskt god! It's more than beautiful! I have always wanted to be a pastry chef! Som den sanna chockoholist jag är så dör jag nästan chokladdöden av den där beskrivningen. The chocolate looks so delicate and amazing! gud så gott det låter. Leslie: Thank you! And hey, you might not be a pastry chef, but you make the best jewelry ever! oh my goodness , please package that cake and send it to me!